Are you bored with steamed food yet? LOL or are you bored with the food recipes and no cake recipes already ?? But whatever it is, I’ll post up a delicious cheesecake recipe next. Definitely not in the mood of writing a whole few paragraphs so this time I’ll just go straight to the recipe. 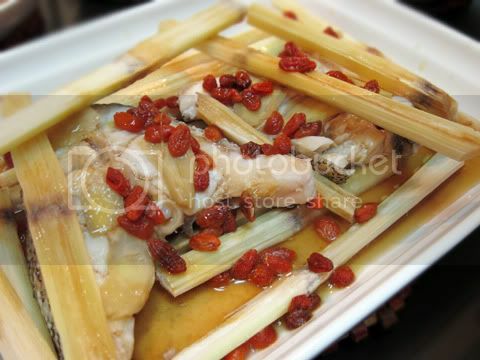 *In this recipe, you can use probably any kind of fish that is suitable for steaming. Sorry I don’t really know my fish. You can use whole fish (about 500g – 700g) or fish slices like me. ** Use sugarcane that is still “young” for more juice. The green-skinned one is good. 1. Spread half portion of the sugarcane sticks on a heatproof plate. Place in fish. 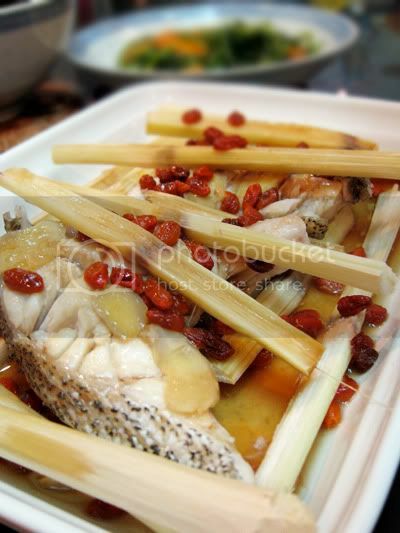 Next, top with the remaining sugarcanes on the fish, sprinkle with shredded ginger and wolfberries on top. 2. Steam fish in the steamer over high heat for 10-15 minutes until cooked. Pour seasoning ontop and serve hot. Sugarcane are probably not that commonly found in markets. But this is a good way to use up the sugarcanes for Chinese prayers. For Chinese New Year, we had probably so many sugarcanes that could probably build a house for my dogs, OK JUST KIDDING, we probably only had 4 – 6 canes. But the nature of sugarcane is sweet, hence it’s like a natural sweet enhancer for the this dish. Obviously now my words are getting haywired. Need a shoulder massage. that doesn’t make any sense either. Love the dish. Inspired use of wolfberries and sugar cane. Cheers! I've never thought of sugarcane. natural sweetness, must taste good 🙂 I loveee steamed fish!